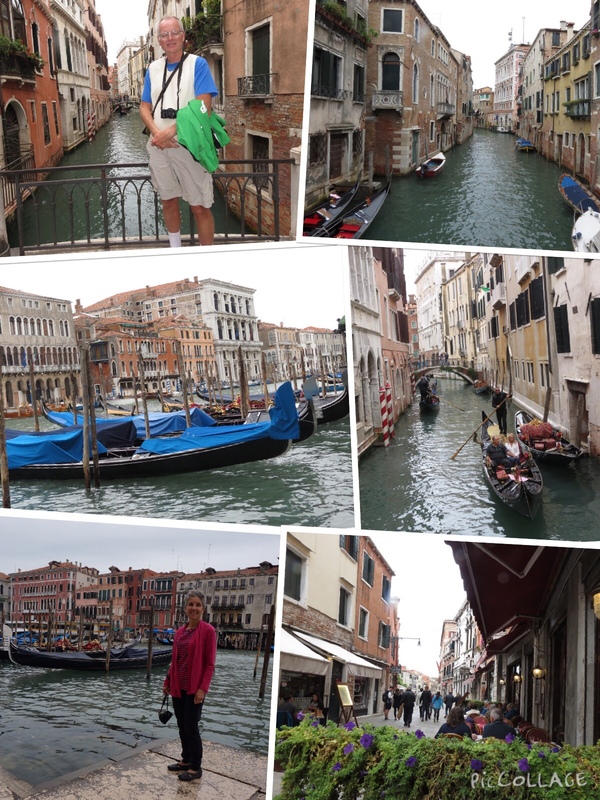 Through the miracles of modern air travel, Rich and I rendezvous in Venice, Italy. He arrives from home in Duluth, and I from England after visiting friends. Voila, there he is when I exit customs, just as planned. We about to embark on our latest travel adventure. This one does not involve bikes. Instead we are leaving the transport to a cruise ship. But first we take in a bit of Venice. To reach the Marine Terminal, we choose to go by water on the vaporetti. 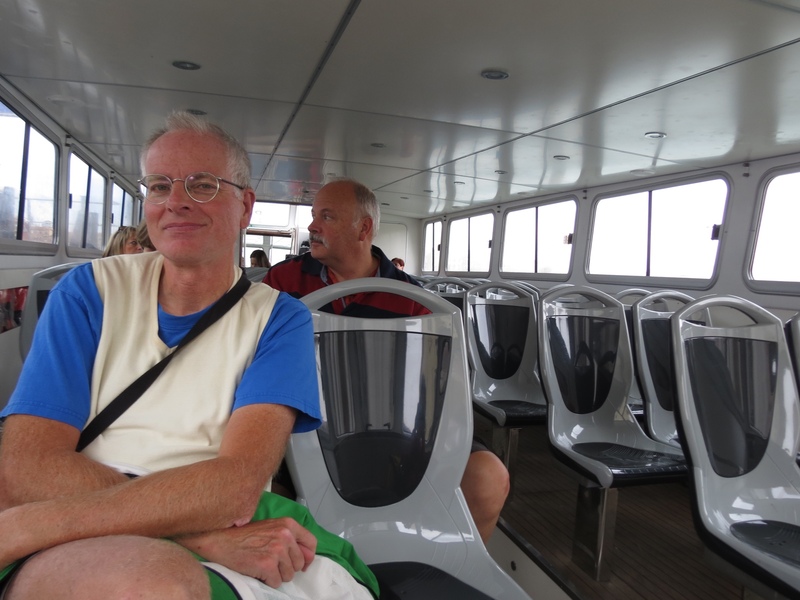 It turns out to be a long and circuitous route, traveling the perimeter of the main island of Venice with numerous stops there and on the surrounding islands. Low to the water, with spray frequently hitting the windows of our vessel, the view is wet but fascinating. We soon realize that there are specific travel lanes for boat traffic, which are not always the most direct route. And boats seem to have designated priorities. Our has to slow down each time a smaller water taxi goes by, which is frequently. The water is turbulent, churning with the wakes of the heavy boat traffic. 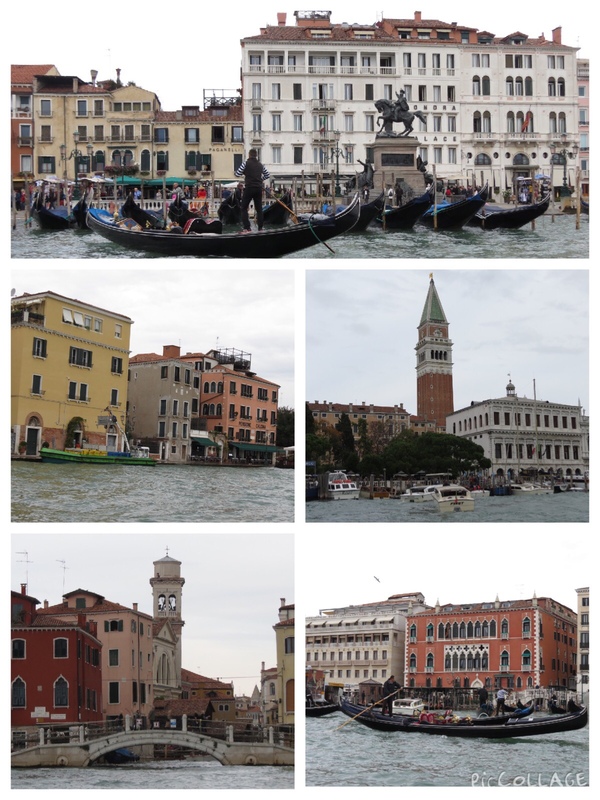 The trip takes almost two hours, but the views continue to get better as we circle the center of Venice. Check-in at Royal Caribbean turns out to be painless, and we happily surrender our heavy suitcases to their care. That leaves us four hours to wander in Venice. 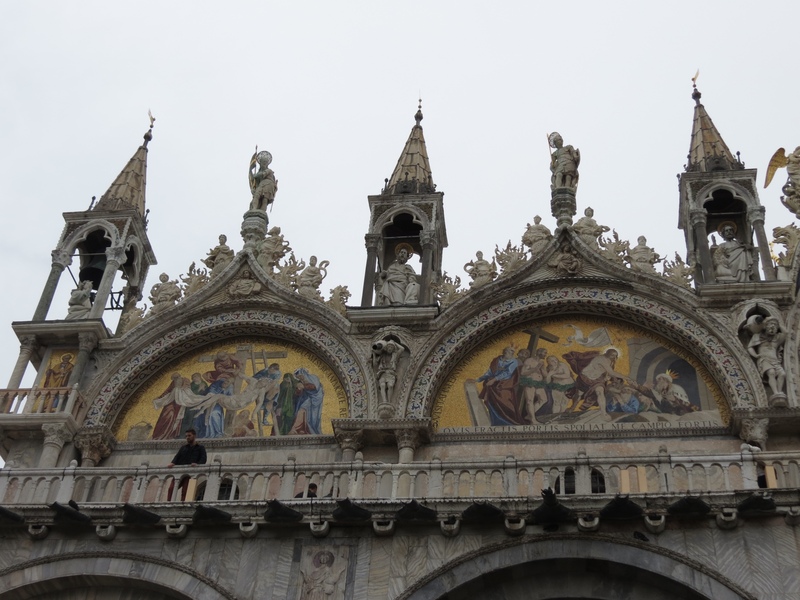 The natural destination is St. Mark’s Square, and we set out to cross the city. There are plenty of other tourists doing the same on this mild but gray October day. We have no planned route. We merely follow the haphazard signs on buildings indicating Rialto and Marcos. It’s a zigzagging course, seemingly bearing no sense. But then Venice is a maze of streets and canals, so straight does not exist. And we don’t mind. The sights along the way are picturesque. In fact, once we arrive in the square it is an anticlimax. Crowded with people, selfie-sticks in abundance, long queues snaking along the front of St. Mark’s Basilica and dominated by the inevitable scaffolding, it fails to inspire. I admire the fine work on the front of the basilica, but honestly prefer the view from the water. So we return to the alleyways of Venice to take in more of their charm. We make good use of this short interlude, enjoying each scene as we pass. And I savor a rich gelato en route. Miraculously we ultimately snake our way back to board the ship. Departing Venice we have a far different vantage point from this morning. Towering above the water, we have a bird’s eye view of the city. We sail away to the voice of Andrea Bocelli and say our farewells, once again seeing Venice from the outside in. This entry was posted in Travel and tagged europe, Travel by Molly. Bookmark the permalink.